When we started to talk about wedding rings on the Facebook widows support group "Lifeboat," I just had to see these sweet symbols of love and commitment--and of course, to show them to you! Some of the group say they'll never take their rings off, some also wear their husband's ring on a necklace chain or on their thumb. Some have refashioned their ring to include the childrens' birthstones, or their husband's. There were almost as many things to do with these precious gems as there were women who treasure them! The one thing everyone agreed on: You wear your rings as long as you want. To some they are a great comfort and fond memory; for other's a source of sadness; and others have feelings that cannot yet be fathomed. Wearing or not wearing your rings is a private and personal issue; it should not be considered "sending a message" about the state of your mourning. Aren't these rings pretty? Most importantly, aren't the women who wear them among the most courageous and beautiful women you know? Climb aboard the Lifeboat with us by simply sending me a friend request on Facebook and I'll add you to this private group. Minister: "May I have the rings. Let us pray. Bless, O Lord, the giving and receiving of these rings. May this man and this woman abide in Thy peace and grow in their knowledge of Your presence through their loving union. May the seamless circle of these rings become the symbol of their endless love and serve to remind them of the holy covenant they have entered into today to be faithful, loving, and kind to each other. Dear God, may they live in Your grace and be forever true to this union. Amen." Groom: "My bride, I give you this ring as a symbol of our vows, and with all that I am, and all that I have, I honor you. In the name of the Father, and of the Son, and of the Holy Spirit. With this ring, I thee wed."
Minister: "By the same token the bride may place a ring on the finger of her groom." Bride: "My groom, I give you this ring as a symbol of our vows, and with all that I am, and all that I have, I honor you. In the name of the Father, and of the Son, and of the Holy Spirit. With this ring, I thee wed."
A kind young king was married to a princess he loved. The king to journey far away. As he sat thinking of his lovely Queen. From where the little pebbles had fallen. To fit the finger of his Queen. My love will last through all eternity." And the beauty of the endlessness of love. 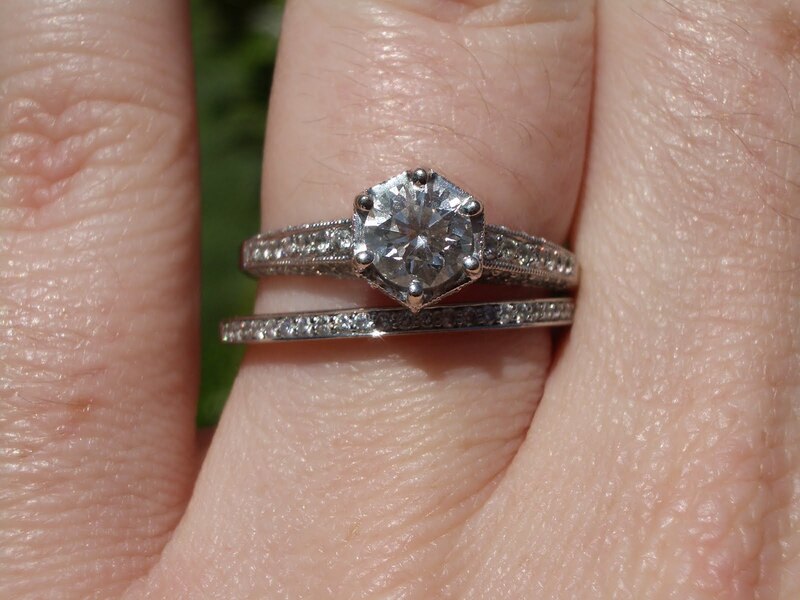 My ring is very special - as I'm sure every wedding ring is to each Bride. I really struggled with taking it off. And it was a really touchy subject. 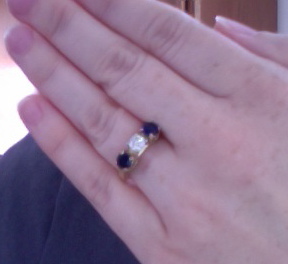 As we live in a conservative Mennonite community, and a month after my husband died, I put the children in a private Mennonite school, who, very kindly, informed me that I could not come onto the school premisis with my ring on. So, for many months, I wore my ring at home, and tried to remember to take it off, and put it in my pocket when I had to go to school. It became such a hastle, and I was so afraid of loosing the ring, that I took it off. I took my rings off on the day of my birthday,8 months after my husband's passing.I felt at peace about it then and still do.As long as Jake was alive they were a symbol of belonging to him,now they no longer held that meaning for me.I still love and miss my husband,but wearing the rings will not bring him back and I need to move ahead in my life. I'm still going to wear my wedding band until the day I die because as far as I'm concerned, I will be married to Ben until I join him again. I have his ring on a gold chain I wear around my neck. I had to have his soldered back together as they had to cut it off of his finger when he was in the hospital. His hands had swollen so much they could not get it off. Six months after my husband died, I broke my left elbow. My rings had to come off because of the swelling and cast. Rather than go through the agony of deciding when/if I should no longer wear them, I just left them off. It was a huge step for me in moving forward.